Horsepower rating is based on standard NEMA B 4-pole motor design as represented in NEC table 430.150 Full-Load Current, Three-Ph Alternating Current Motors. Also, listed power ratings assumes three-Ph input. For single-Ph input applications, consult Manual Supplement TOEPYEASUP03 for proper sizing. Standard Enclosure can be conventionally mounted, or heatsink external (kit required for models CIMR-AU2A081FAA and smaller). Flange Enclosure includes special factory-installed gasketing and flange to provide NEMA 12 backside integrity when mounting heatsink external. Flange Enclosure includes special factory-installed gasketing and flange to provide NEMA 12 backside integrity when mounting heatsink external. Flange parts can be removed if convential mounting is desired. Horsepower rating is based on standard NEMA B 4-pole motor design as represented in NEC table 430.150 Full-Load Current, Three-Ph Alternating Current Motors. Please note: 300-350HP (ND) are in development. 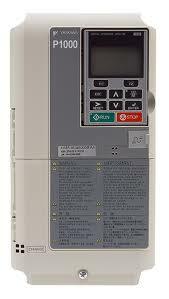 If you are looking for Yaskawa ac drive system(P1000), please contact us. We will do our best to help you find the Yaskawa drives that you are looking for at the most competitive prices possible.